Kenneth Wayne and Erik Neil, editors. 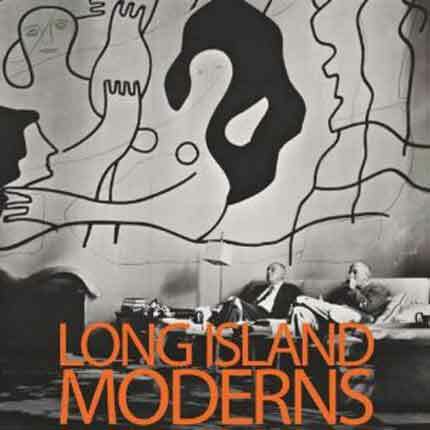 Long Island Moderns: Art and Architecture on the North Shore and Beyond. Huntington, NY: Heckscher Museum of Art (Distributed by University Press of New England, Lebanon, NH), 2009. Illustrations, bibliography. Pp. 128. ISBN: 9781879195158. $29.95. In their essay “Learning from Levittown” Robert Venturi and Denis Scott Brown use that iconic Long Island suburb to describe an attitude that rejects modern design as sterile and anonymous. Erik Neil, curator of a recent exhibition at the Heckscher Museum, Arcadia/Suburbia: Architecture on Long Island 1930-2010, seeks to reveal an alternate story. Both the exhibition and catalogue start with the 1931 Aluminaire House by Albert Frey and A. Lawrence Kocher – an example laden with contemporary issues of modern architecture and urbanism in the United States. Designed as an exhibition house for the Architectural League Exhibition, April 1931, in New York City, it was transplanted to Long Island by the architect Wallace K. Harrison to serve as a weekend house on his property in Huntington. The next year it was included in a MOMA exhibition curated by Philip Johnson and Henry Russell Hitchcock—representing not a prototype for housing, its intention along with the display of modern materials, but bucolic isolation. In From Bauhaus to Our House, Tom Wolfe poked fun at American architects applying European modernism—born of a movement to house workers—to the vacation houses for the wealthy. The Aluminaire House’s move to Long Island contains some of Wolfe’s wicked irony. Happily, curator Neil represents the house through Albert Frey’s original drawings. Houses of this period represented in photos include the Kocher and Frey canvas weekend house in Northport and Harrison’s own house in Huntington. A spectacular photo of the interior of the Harrison house shows the round living room with a mural by Fernand Leger. The Harrison household was important as a meeting place for artists and architects, and is described in both exhibitions. Also in the early history of Long Island Modernism is Percival Goodman’s plan for Hempstead and the images of one of the units. It is unfortunate that this is not illustrated in the catalogue as it counters the notion that Modern architecture takes the form of isolated houses. The opportunity for well-known architects from New York City and beyond to experiment on Long Island is demonstrated with the work of Marcel Breuer, Herbert Bekhard, Philip Johnson, Edward Durrell Stone, Richard Meier, John Hedjuk (Dean of Cooper Union), Paul Rudolf and Charles Moore (both Deans at Yale), and Robert Venturi and Denis Scott Brown. The postwar work of Long Island architects, including Fred and Maria Bentel, Walter Blum, and Andrew Geller, are represented by beautiful drawings and models. In the segment on non-residential work, large corporate projects have no local roots, making it difficult to relate these designs to Long Island. Neil cites a quote from Richard Meier to illustrate an attitude at the end of the 20th century which had changed from the optimism of the early century. Commenting on the subject of his Swissair building, Meier said “this new airline headquarters … offered an opportunity to place a building of distinction in an otherwise nondescript landscape of careening freeways and scattered, rather mediocre suburban development.” The curator notes that architects are now trying to face the issue of the automobile through planning proposals (the authors of this review are pleased to be included for their own Port Jefferson proposal in the catalogue). The third essay by Sandy Isenstadt focuses on the planning and creation of Levittown, one of America’s earliest suburban subdivisions. The piece forces us to consider the idea of community on Long Island, and brings us back to the Aluminaire House. In 1931, Kocher and Frey proposed clusters of units to maximize space and light keeping the density of block development equal to the New York City standard of the time, lot sizes of 2500 square feet. They proposed a startling new aesthetic, built of new materials, as did Percival Goodman in his Hempstead plan. In 1947, the Levitts proposed a transformation of dense development, dividing agricultural land into suburban lots, approximately 8000 square feet (the houses were only 750 square feet), mass-produced in terms of labor, but familiar in style and materials. Isenstadt is neither apologetic nor overly critical of the iconic project. His description of contemporary architectural criticism of the project is particularly interesting in regard to the aspirations of “modernism.” However, he avoids the significant, long-standing criticism of suburbia related to low-density sprawl of the “bedroom community,” dependency on the automobile that brought profit to the auto manufacturers, highway builders and petroleum industry at the expense of investment in the decaying inner city. Architects and planners were aware of this decades before Levittown, with successful “garden city” plans like Sunnyside Gardens, less than 20 miles away, or Radburn, New Jersey, which was touted as “a town for the motor age.” Thus the third article in the catalogue on Levittown, that articulates one kind of suburbia, must be seen as a debate with the second, describing modern architecture in search of arcadia.